For me, the best deodorant for women should not contain harmful toxic ingredients that are dangerous for that sensitive area of the women´s body which is near their breast glands and is the armpits. Finding a deodorant that contains organic and natural ingredients is a good solution, however, not all of these types of deodorants are effective in preventing odor. So, here is a look at the most effective natural deodorants on the market today. Do keep in mind, though, that this is a deodorant review not an antiperspirant review so while these products will help keep odor at bay, they won’t prevent you from perspiring. The Green Tidings All Day Protection Natural Deodorant is available in a 2.7 oz recyclable and free of BPA tube and in a 1 ounce trial size container that is handy for travelling or for working out at the gym. This deodorant is made in a USA solar powered facility and is SLS, parabens, mineral oil, propylene glycol, petroleum, phthalate, paraffin and aluminum free. It does not contain silicones, artificial colors, menthol and phenol. It is also cruelty free as well as gluten, soy and corn free. Some of its ingredients are organic coconut oil and shea butter, pure lavender essential oil, free of aluminum baking soda, magnesium oil and a couple of others. Reviews for this product are very good with most users really liking the fact that this product comes in a stick form. Several of them have felt that this is the best natural deodorant on the market and it works very well. While satisfied users found they had no irritation using it, few dissatisfied ones experienced a bit of itching and even rashes. This may be due to the use of baking soda which can be a bit irritating in the beginning till the body gets accustomed to the pH of baking soda. In addition, most people find this deodorant to be expensive though many feel it is worth the price. 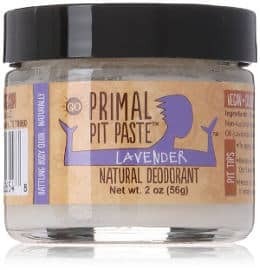 The Primal Pit Paste Natural Deodorant comes in a 2 ounce glass jar and is chemical free. It contains organic and natural ingredients and no aluminum, parabens or other chemicals. It is also cruelty free. The aluminum free baking soda that it contains neutralizes the bacteria that create odor while the organic arrowroot powder makes the skin in the armpits feel dry. Antimicrobial organic coconut oil is nicely combined with organic shea butter to soothe your skin. This is a regular strength deodorant paste which the company recommends to the first time users so that their body gets used to the baking soda´s pH. They also suggest that it is best to use the product within 12 months during which you should keep it away from extreme heat temperatures since it contains coconut oil which in high temperatures turns into a liquid form. Still, if your paste melts, you can stir it and put it in the fridge for 30 minutes so that it regains its paste texture. This deodorant is handcrafted and contains no artificial fragrance but is naturally scented with lavender essential oil. Ratings are very positive. Users say that it leaves behind no white residue once they rub it into their armpits and it does not stain their clothes or feel greasy. They also find that one application lasts all day and the deodorant goes easily. Also, the jar lasts for several months since you only need a little bit of this paste to rub into your armpits to stop odor. Few users have not liked its scent although many others find its scent to be mild. While this paste works for most users, it didn’t work for everybody similarly well. 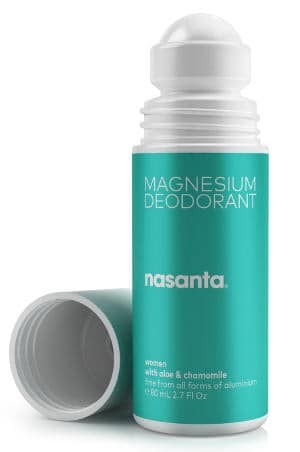 Manufactured in Australia, this cruelty free Nasanta Magnesium deodorant for women comes in a 2.7 ounce roll on container and is totally free of all forms of aluminum. It contains magnesium, water, coconut derived glycerin, xanthan gum, chamomile, aloe and menthol. The two preservatives used are 0.35% of Phenoxyethanol and 0.15% of Caprylyl Glycol. It is free of ethyl alcohol, paraben, propylene glycol, triclosan as well as talc and does not contain baking soda or any essential oils. 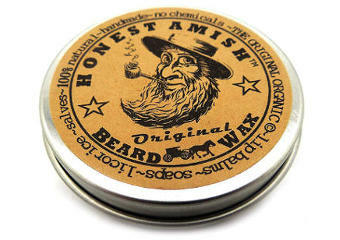 It does not stain and is tested for not stinging or irritating sensitive or freshly shaven skin. The aloe and chamomile it contains soothe the skin and keep it hydrated. This product will last you for more than three months. This magnesium deodorant gets very good reviews. It goes on wet, but takes a short time to dry completely. The application is easy and the product has no scent. Users feel that it really controls odors and keeps you feeling fresh. Also, it does not stain clothing. Bali Secrets Deodorant is an all natural, gluten free and vegan deodorant that comes in a recyclable and BPA free 2 ounce container. 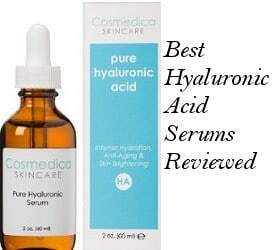 All the ingredients in this product are rated safe by the Independent Cosmetic Database and it does not contain aluminum chlorohydrate, aluminum zirconium, parabens or phthalates. It has no added fragrance and contains seaweed extract, distilled water, natural mineral salt, aloe vera gel, alcohol and coconut oil. It can last for 3-4 months and is the only product in this review that offers a 100% money back guarantee. Overall, it gets excellent reviews and most users state that it really works well to prevent odors. It does go on wet but dries quickly and won’t leave any residue on your clothes unless you put it on thickly. Few users have felt that it leaves their underarms feeling clamming and some others have said that they are not so fond of its scent. 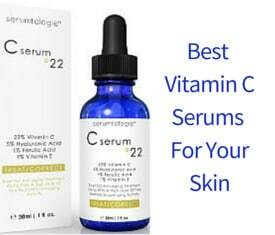 It should also be noted that since it contains alcohol, it might irritate or dry out the skin of some individuals. The DeodoMom Lotion Deodorant is a hypoallergenic and natural deodorant that contains only two ingredients, water and magnesium hydroxide which is a safe mineral. It is free of potassium alum, alcohol, aluminum, fragrance, dyes, parabens, baking soda, propylene glycol, beeswax, silica and peroxide. It is 100% vegan, comes in a small 2 ounce container and you can purchase it either in a roll or a deodorant cream. This is a unisex formula that does not leave residues and is great for people who have sensitive skin since it is not irritating. It can last for three months. This natural deodorant gets very positive reviews with most users saying that it does an excellent job at preventing odor and that it goes on easily and dries quickly. They also like the fact that it has no harsh chemicals and causes no irritation. The Crystal Body Deodorant stick comes in a 4.25 ounce container. It is hypoallergenic and both fragrance and paraben free. It is made of 100% natural mineral salts and in order to properly use it, you need to dampen the end of the stick before rubbing it under your arms. Reviews for this product are quite good with the majority of users stating that it keeps their odor at bay. Some users find this deodorant somewhat difficult to apply and say that it can burn if you apply it right after shaving. In conclusion, finding a good natural deodorant is not easy since everyone is not the same and a deodorant that may be highly effective for one person may simply not work similarly good for another. So, when looking for the best deodorant for women, it may take a little trial and error before you find the one that really works for you. However, this review will hopefully point in the right direction.